A major effort to swing at least five key Republican senators behind immigration reform will be the key task of Senator Charles Schumer of New York, who is leading the effort in the senate to create new legislation. Tens of thousands of Irish undocumented are among those anxiously awaiting new efforts this year to bring about reform. The last effort to create a bill, called the Kennedy/McCain immigration bill failed when Republicans refused to support it. However, the new bill, which Senator Schumer and aides to President Obama are working on, will have strong enforcement measures in it in addition to a plan to legalize those here illegally. President Obama has given a commitment to take up the issue soon after his health care reform bill passes, as is generally expected. Schumer is counting on Republican Senator Lindsay Graham of South Carolina, who has indicated that he will support a new bill that has strong enforcement measures and ensures that illegal immigration will be much harder after the bill passes. 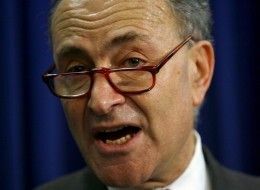 "Schumer wants to show that legalizing the undocumented is actually good national security policy, as well as making it clear that it will become much harder for new illegals to work here if the new bill is passed" said a source. Hispanic groups who have major clout with this White House are concerned that the proposed bill leans too far in the enforcement direction. Among other senators on the Republican side that Schumer hopes will be reachable are Senators Olympia Snow and Susan Collins in Maine, Senator George Voinovich in Ohio and Senator John McCain of Arizona, who sponsored legislation before. A House bill has already been introduced by Congressman Luis Gutierrez of Illinois, a close supporter of President Obama. RAD~An update on CIR, and a reminder that immigration policy is not only about the border with Mexico.